Blending loose tea into cocktails is a fast effective way to infuse light herbal and bitter flavors. Chamomile is soothing and has a round floral after taste. Absolut is the perfect vodka to blend in this eye catching cocktail. Procedure: In a mixing tin add the 2-3 teaspoons of loose leaf chamomile. Add 2 oz.’s of Absolut Vodka, and .75 oz.’s of Finest Call Bar Syrup. Freshly squeeze 1 oz. of lemon juice using an elbow squeeze and add it to the tin. Add one egg white and fill the tin 3/4 with ice. Shake the cocktail vigorously and then crack the tin and strain the ice. Reseal and shake again in a smooth circular motion to develop the foam. Crack the tins and double strain the cocktail from above a chilled coupe glass. (Do not rest the double strainer in the cocktail, it should be elevated) Once you have strained the cocktail garnish with a few buds of dry chamomile flower and 3 angostura hearts. Garnish: chamomile and angostura hearts. Be sure to use a precise dropper with your bitters in order to create small precise dots. Drag a thin skewer through the dots to create a heart like shape. Daiquiris are one of my favorite classic cocktails. The simple marriage of rum, sugar and lime juice never ceases to be refreshing and delicious. 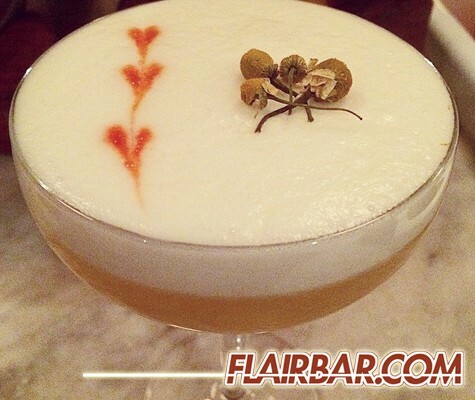 Daiquiris are easily manipulated with the addition of seasonal fruit, herbs and spices. Try this one and do your best to not eat all the berries so you have some for garnish. Procedure: In a tin muddle 8-10 blueberries and add the mint leaves after slapping them to express the oils. Add 3 turns of freshly cracked pepper, 2 oz.’s Tanduay Silver Asian Rum and .75 oz.’s of Finest Call Bar Syrup. Freshly squeeze 1oz. Of lime juice in an elbow squeeze and add it to the tin. Fill the tin with ice and shake vigorously. Double strain into a chilled Nick and Nora glass, garnish and serve. This cocktail is something I created for a cocktail competition being hosted by Dillon’s Distillery from the Niagara region of Ontario Canada. If you live in some major markets like Chicago, Miami/South Florida and New York City you may have seen Dillon’s spirits and bitters in your local haunts. One of Dillon’s most compelling spirits is their white rye which although grain based shares similar attributes to the moonshine of the prohibition era. This cocktail blends the spicy and untamed/imaged rye with soft and botanical Flavors in the Cocchi and cherry wood. 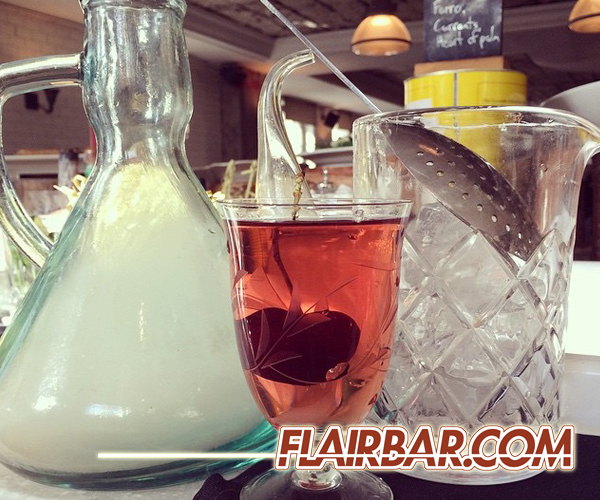 You’ll need a smoking gun to perform the smoke infusion in this cocktail. Procedure: Select your final glassware and fill with ice to chill. In a mixing glass filled with ice add 1.75 oz.’s of Dillon’s white rye, 1 oz. of Cocchi La Rosa, .25 oz.’s of Edmond Briottet Marasquin Liqueur and 4 dashes of Dillon’s DSB bitters. Stir the cocktail well allowing for up to 25% dilution. Prepare a culinary smoking gun with shredded cherry wood and strain the mixed cocktail into a smoking vessel such as a decanter. Using the smoking gun, fill the vessel with cherry wood smoke and allow the flavors to infuse will gently stirring the cocktail. Dump the ice from your serving glassware and pour the cocktail from your smoking vessel into the serving glass. Zest a grapefruit peel over the cocktail and garnish. 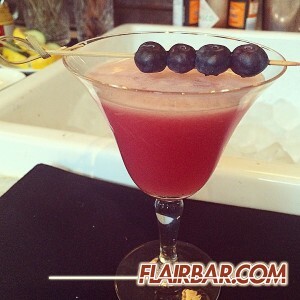 Garnish: Garnish with one fresh, dark red cherry.